Lewes gained sweet revenge on the last-minute defeat back in October to beat Worthing in a pulsating game of football, reports Stuart Fuller. Darren Freeman made one change from the draw at Enfield Town, bringing in Charlie Coppola for Leon Redwood, although Michael Dome-Bemwin returned to the bench after a few weeks out with injury. The opening exchanges saw the hosts dominate with a series of corners that put the Lewes defence under pressure. However, at the other end it seemed that the hosts would make a mistake at some point in their playing from the back tactic and that was what happened in the first talking point of the game in the 27th minute when a ball from the keeper to Ricky Aguilar was stolen by Omarr Lawson and as he went through on goal, the Worthing man hauled him down. The referee pointed to the spot but overturned his decision after consulting with the assistant referee who deemed the offence just outside. Nevertheless, the officials saw it as denying a goal-scoring opportunity and the former Lewes youngster was shown a straight red card. The next talking point came less than five minutes later. Lawson was again fouled, although this time it was on the half-way line. 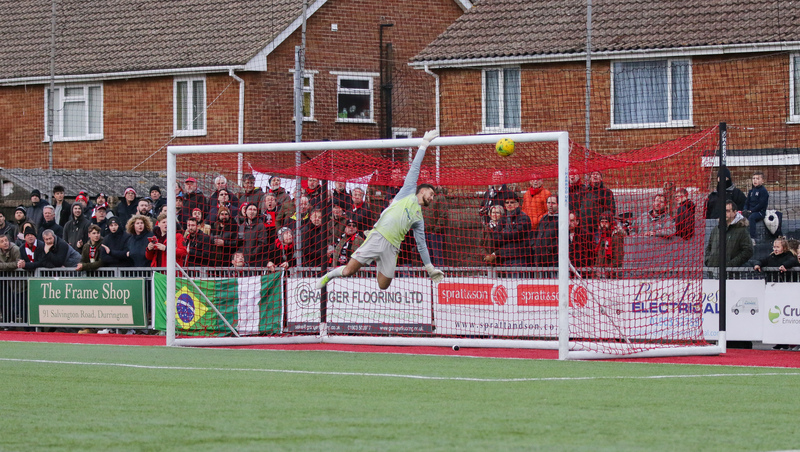 James Hammond saw the Worthing keeper off his line and shot from just inside the Worthing half. The ball flew into the net, hit the ground, bounced up onto the bar and out again. The Worthing fans and players claimed it hadn't gone in but again the assistant referee had the decisive say, informing the referee that the ball had crossed the line (video evidence proves this the case too) and the Rooks had the lead. However, that lead lasted just 90 seconds as a harsh free-kick was given on the edge of the Rooks area and Ollie Pearce expertly flighted his free-kick over the Lewes wall and beyond the dive of Lewis Carey. The home side were then forced into a change as the dangerous David Ajiboye was forced off, with former Rook Callum Kealy replacing him in the 43rd minute. However, it was a former team-mate of Kealy who caused the damage in the final minute of the half as Charlie Coppola controlled a difficulyt ball, beat two Worthing players as he ran across the edge of the box and fired into the corner, via a deflection. Worthing certainly started the second half the more dangerous, putting the Lewes goal under early pressure but it was the Rooks who extended their lead in the 52nd minute. Former Rebel Kieron Pamment danced his way into the area before shooting, which keeper Perntreou could only parry into the path of Luke Blewden who made no mistake from 10 yards. The Rooks could have had a 4th when Coppola's neat turn and shot just spun wide of the far post. Instead it was at the other end that the chances started to fall. Veteran midfielder Darren Budd came on to replace Aaran Racine and he delivered the corner that Crystal Palace loanee Jalen Jones powered in with 20 minutes to play. Nervousness crept into the Rooks side as they desperately defended, praying that lightning wouldn't strike twice in a season having been 3-2 up and playing against ten men when the sides met back in October. In the 90th minute though the nerves seemed to be settled when a sweeping move from left to right saw Jonte Smith dummy the ball for Callum Overton to run onto and smash home his first goal for Lewes. But Worthing weren't done and in the 6th minute of injury time a scramble in the Lewes area saw the referee award a penalty, then bizarrely brandish a second yellow for Worthing's Darren Budd. Ollie Pearce smashed home the penalty to make it 4-3. Despite the efforts of the home side, Lewes sat firm for the final few minutes and recorded another excellent away victory, one that took them back up to 2nd in the table. Post-match, assistant manager Ross Standen spoke to Barry Collins about the game. The Rooks return to the Dripping Pan next Saturday for the Bostik League Premier Division game against Wingate & Finchley, kick-off 3pm.